Final Fantasy III is a role playing game for the Nintendo Entertainment System. 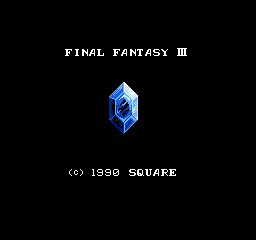 This is a translation patch of Final Fantasy III for the Famicom/NES. This patch utilizes the MMC5 mapper patch made by Kea, which allows for 1 megabyte of ROM space, allowing for a much larger amount of space available for text data. An entirely new script was written that borrows text from the Nintendo DS remake where applicable. About ~75% of the text was taken straight from the DS remake, while the other ~25% was simply translated from the original Japanese text, while trying to make sure the tone of the text matches that of the material that was used from Square Enix’s DS remake of Final Fantasy III. The Japanese Famicom version text for every message index in the game was looked at to ensure when it’s appropriate to use text from the DS remake, and when it’s appropriate to translate the original text instead. The terminology used in this translation matches that of the modern official releases of Final Fantasy III. All character, item, and enemy names match the ones used in the DS remake as close as possible. Please apply the patch to a clean Japanese Final Fantasy III ROM. If you find any typo’s or have any suggestions, please let me know by posting in the discussion thread.